Today at an exclusive AT&T/RIM event held in New York City we had the chance to play with the newest device in RIMs arsenal -- the BlackBerry Torch 9800. A mix of touchscreen and familiar QWERTY keyboard, this is the first slider BlackBerry and looks like it could possibly be the best BlackBerry to date. It will also be the first device to have BlackBerry 6, RIMs latest "revamped" OS. The Torch will be officially available for purchase on August 12th for $199 exclusively through AT&T (for now). While you'll have to wait a few weeks to get your hands on one, we had the chance to play around with it and see whats new both with the device itself and the all-new BlackBerry 6 operating system. Read on for our first impressions. Picking up the device you just want to touch it. Not because it's a touchscreen, but because it just feels amazing. The construction on the device is as solid as it gets, and it just flows well and feels amazing in your hand. If you didn't know it was a slider, you really wouldn't even want to open it. The first things you notice are the screen (same size as the Storm) and the familiar BlackBerry buttons (Send, Menu, Back, End) as well as the optical trackpad. The right side the volume buttons, headset jack and convenience key, while the left side has only the microUSB port and a left-side convenience key is noticably absent. Sliding the device open reveals a full QWERTY keyboard buried stealthily below the screen. The sliding does not feel cheap by any means. As you glide it open you can feel it go where it needs to be and click into place. There is no in between or looseness in the process. Once open the Torch looks a bit odd having a big display over top of the full keyboard, but it doesn't feel top heavy or off balanced at all as we previously suspected it might. Sliding the device closed is just as easy, and once there it is not at all loose or prone to open. The back of the Torch resembles that of the Storm to an extent having the camera/flash on top and the battery door below. The battery door looks to be brushed aluminum and has a very solid feel, and again no looseness at all. Inside you'll find the battery, microSD card and SIM all strategically tucked away. The keyboard holds the same basic design as both the Bold 9700 and Tour models, but it is surprisingly thin. It takes a bit of getting used to, but once you get going it is as smooth as a BlackBerry keyboard can be. Same goes for the on screen keyboard. In either potrait or landscape mode typing is easy and accurate. Change the device orientation with the keyboard open and there is almost no delay as it switches between portrait and landscape. 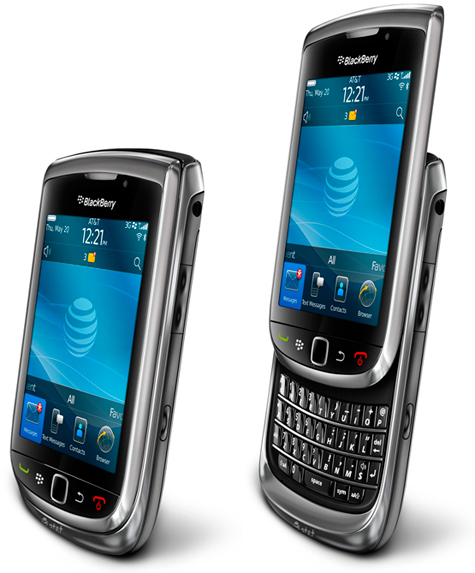 At heart the Torch resembles the Bold 9700 only with double the internal memory (512MB). The display shines bright and looks amazing at 480x360, but a higher resolution display would have really tricked this guy out. The camera gets an upgrade to 5MP which is a very welcome addition, and includes face detection, flash, multiple modes and much more. There is a new viewfinder and "scenes" that allow for different types of images, most notably the zero-lag sports mode. Video recording sadly isn't much improved (still no HD) and is slightly better than the bold 9700 at 640x480. Navigating around the homescreen was both amazing and fun with BlackBerry 6 (read more below) but it did take all we had not to press in and try to get the screen to click. Where oh where do we begin on this one? Ever since we saw the first promo video of BlackBerry 6 back at WES 2010 we've been chomping at the bit to play around with it -- and now, for the first time we have. A collective "wow" gets inserted here. It would take forever to sum up all the new features, but BlackBerry 6 is where it's at. The homescreen has five views -- All, Favorites, Frequent, Media and Downloads -- all of which serve their purpose and do it well. Dragging up the tray from the bottom of the screen reveals your icons, and you can then swipe left or right to change views. Scrolling through was quick and easy and there was really no noticable lag. Tapping an icon opens the application, alternatively you can use the optical trackpad to get around as well. Some great "shortcuts" have been added into BlackBerry 6 as well. All of the items in the banner are now clickable. Click the signal indicator to jump to Manage Connections, the clock to open the Clock app, message alerts to see your Messages and the profile icon to change your profile. Very cool. Overall there is a really a new coat of paint all around. The application switcher has been updated allowing for easy flow between apps. It has a new look and is much improved which should make for much easier multitasking. Icon menus are much cleaner and things just look amazing. Save the best for last? Of course! How bout that WebKit browser??! Its what a browser on BlackBerry should be. No longer will we avoid using it (admittingly we have in the past). Tabs, speed, pinch to zoom and more - its all there. MUCH more on this to come so stay tuned. Ultimately the Torch is where its at. We'll have loads of BB6 and Torch coverage in the coming days, so keep it here as things get rolling.